It may seem strange that I am including this dance in a series about the Urmston collection, when that collection contributes only two relevant masks to this post. I am doing so because I am so pleased to have the opportunity to present one of the Caines masks with all the rest—the complete dance (except for Santiago’s horse)—after unsuccessfully seeking one for decades when I was actively buying masks. 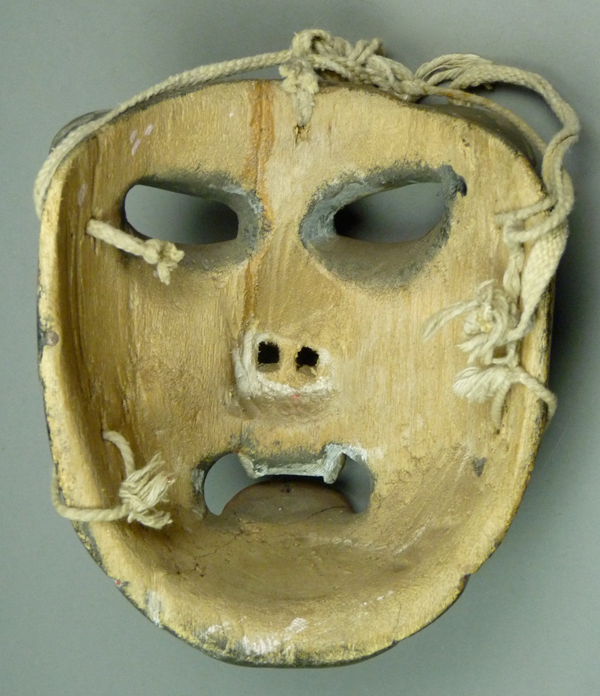 For some reason, it is rare to see one of these Caines masks for sale, let alone one that is so old and worn. You will have the opportunity to compare that mask for age with this one that follows; note the similarity of the eyes. 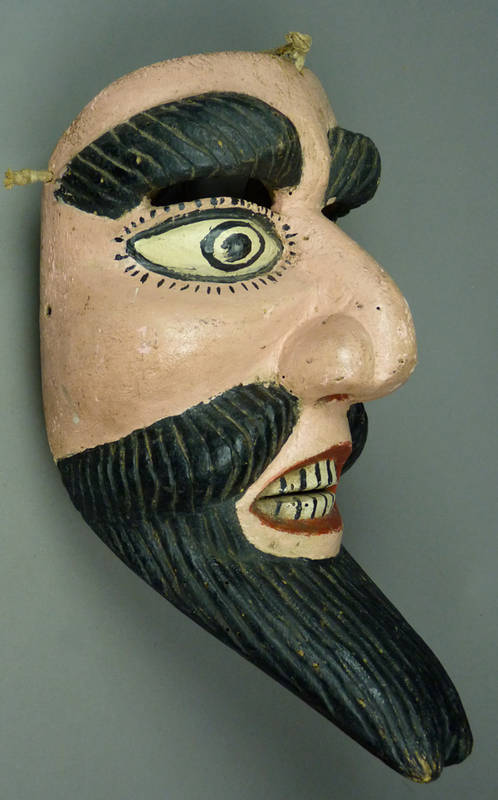 I purchased this Pilato mask from René Bustamante in 1994. It is riddled with pinholes resulting from an earlier infestation with boring insects. 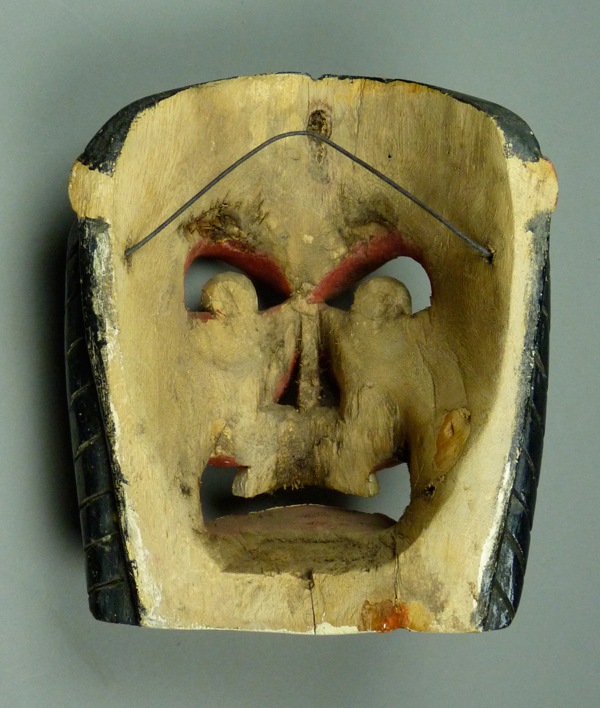 An astonishing feature of this mask is that it was elaborately signed by the carver. 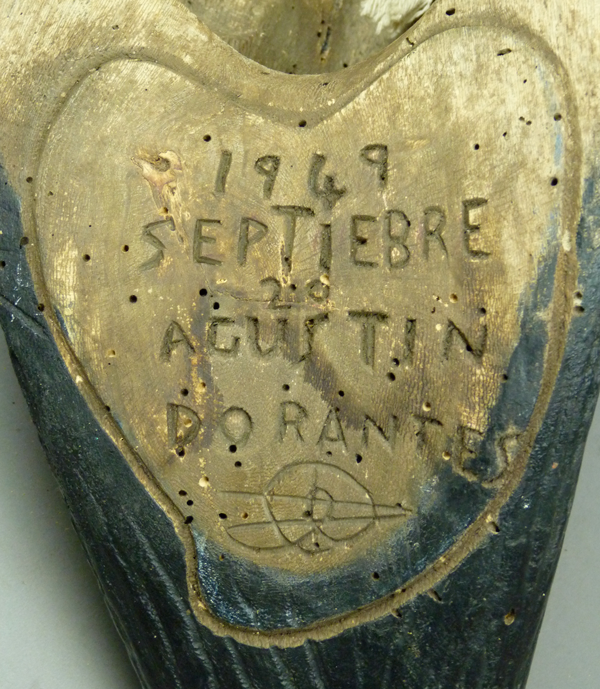 This mask was carved on September 20, 1949 by Augustin Dorantes, who included his mark at the bottom. 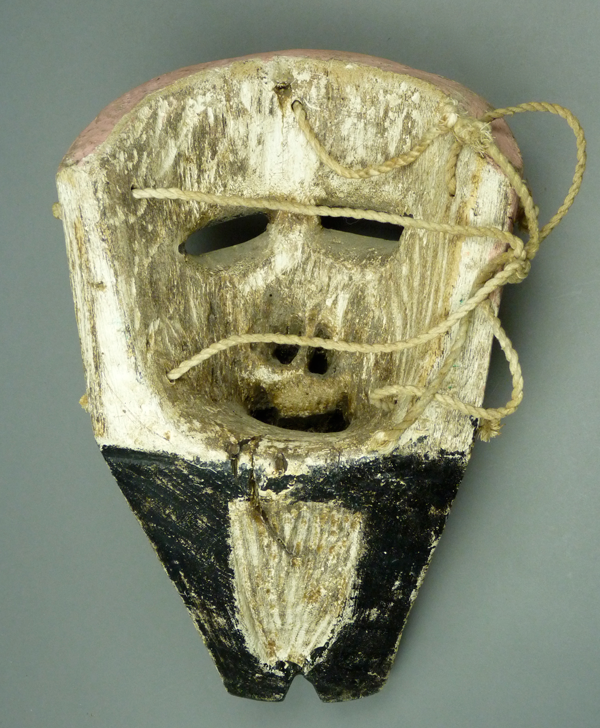 Here is another Pilato mask that I got from René in 1994. This one may have been carved by Lino Mora Rivera, but it is unsigned. The eyes are in one of the styles used by Lino Mora. I like the contrast between the soft features of the face and the angular carving of the beard, mustache, and brows. 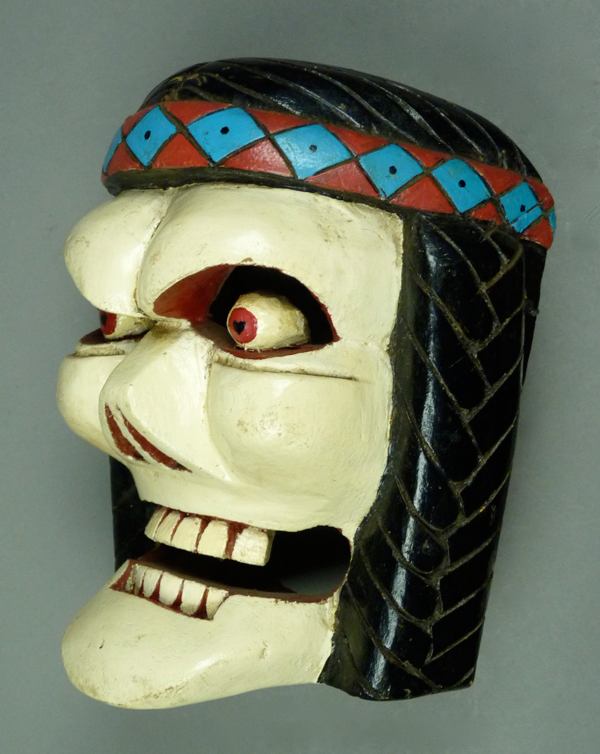 This mask is also 15 inches tall, 8 inches wide, and 8 inches deep. 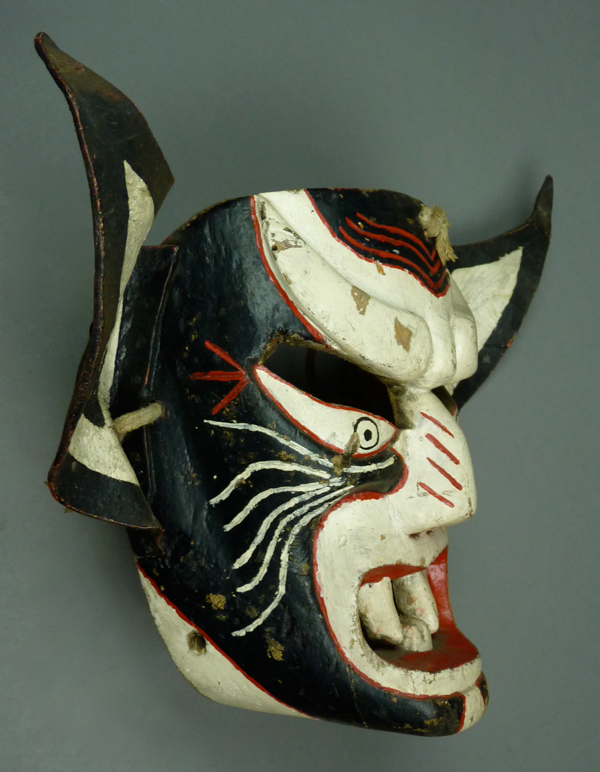 The irregular surface of the back of this mask was painted. With use some of the paint has worn off. 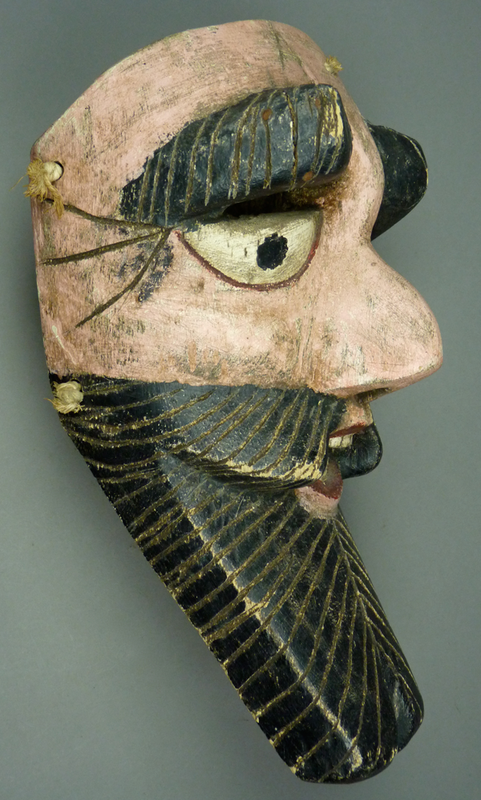 A series of Negritos (Dark Ones) masks from my collection will follow. 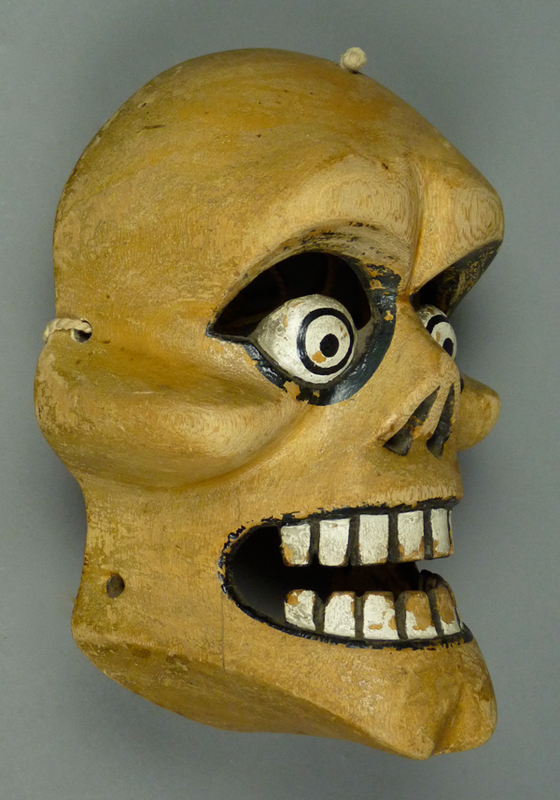 The first is a Calavera (skull) that was carved by Lino Mora Rivera of Naolinco, probably in the 1970s. 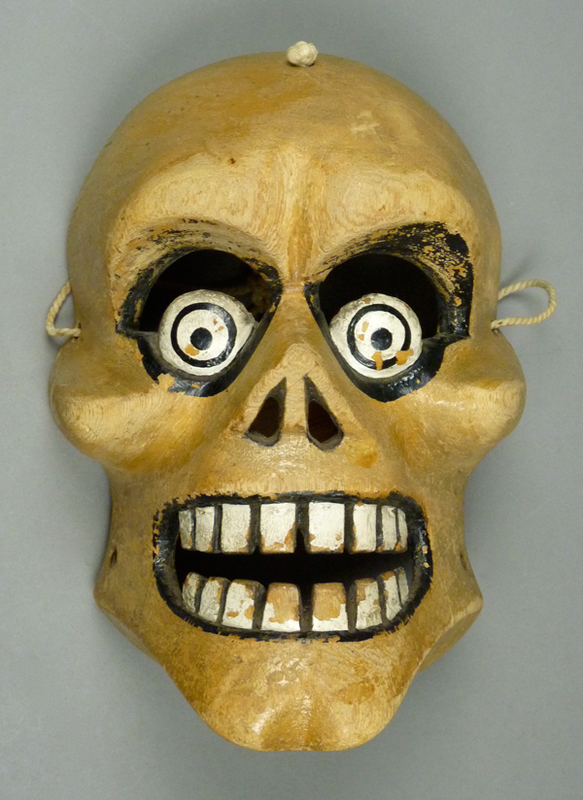 I bought this mask from Robin and Barbara Cleaver, of Santa Fe, in 1987. You may have noticed a boy in the dance video who was wearing a mask just like this one, along with a sort of Robin Hood costume. The chin on his skull mask was slightly longer and more exaggerated than this one. 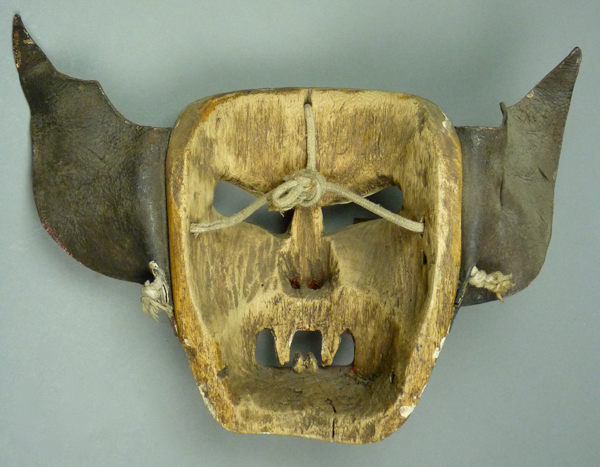 This mask has those “bulls eye” eyes that Lino Mora often includes on his masks. He also favors another design like the eyes on the second Pilato mask. It is 9½ inches tall, 7 inches wide, and 4½ inches deep. 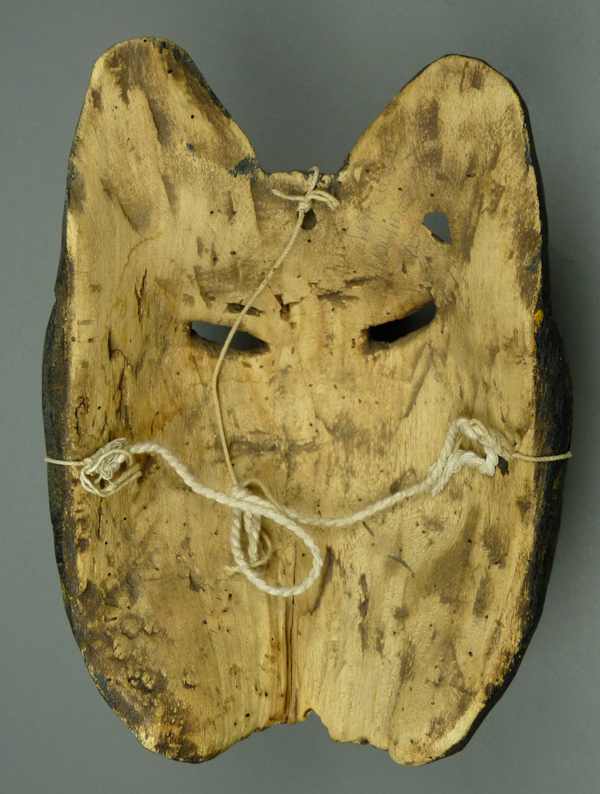 The back of this mask has been sanded, although some areas were left with their earlier patina. Note the carved initials below the left eye—linked LMR for Lino Mora Rivera. 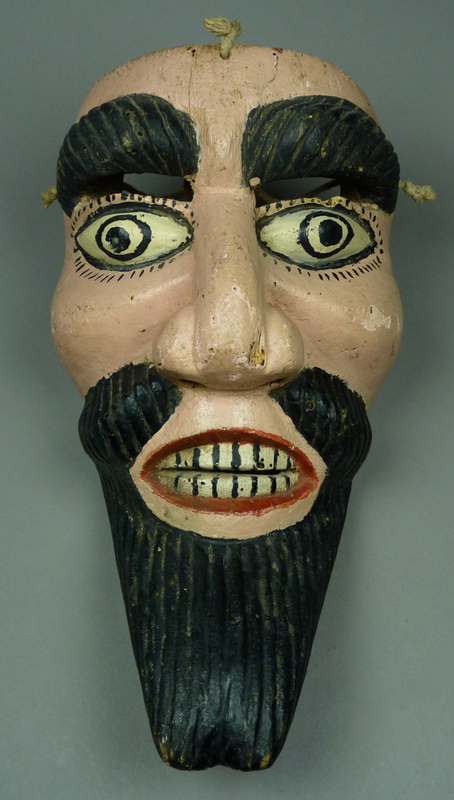 Here is a You Tube™ video from 2011 about Lino Mora Rivera and his masks. There he states that he began carving when he was 11 years old. 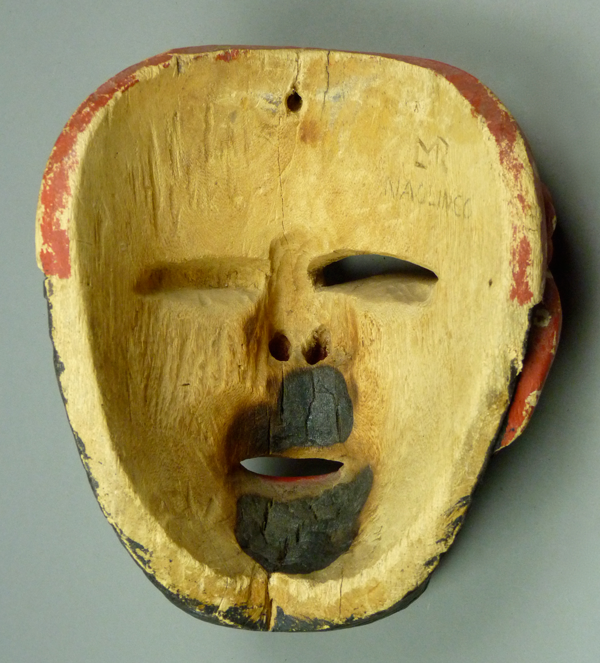 He adds that there were 400 mask carvers in Naolinco at the time of the interview. 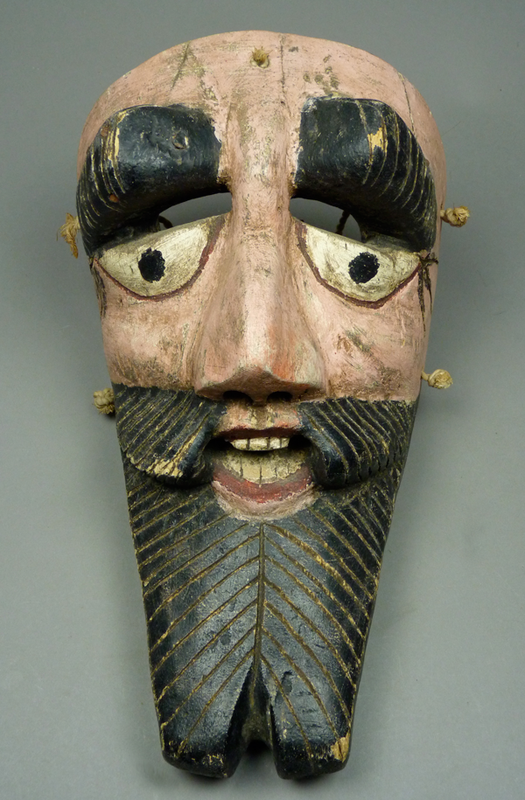 Lino was born in 1954, so his earliest masks date from 1965. 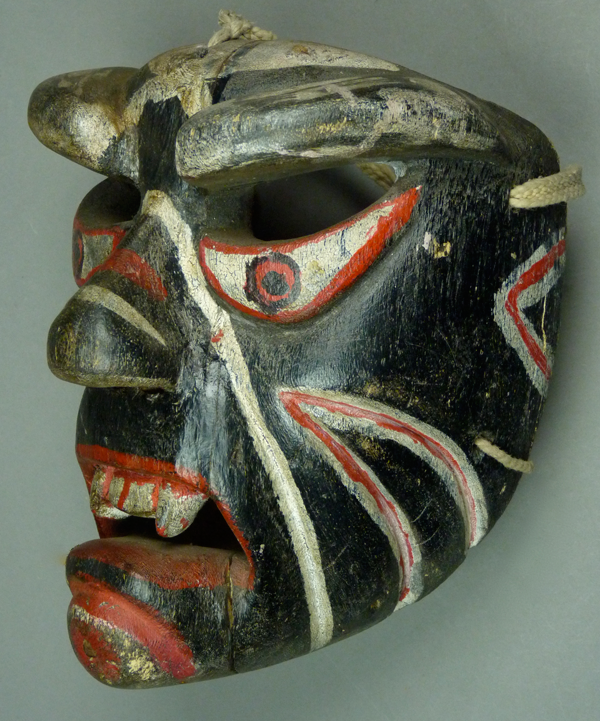 His father was also a mascarero (mask carver) and some of the unsigned masks in this post may have been carved by his father. Here is another link about Lino. If you left click the photo it will expand. Another skull is portrayed as an Indian, with braids and a headband. The carved opening for the eyes s particularly dramatic. 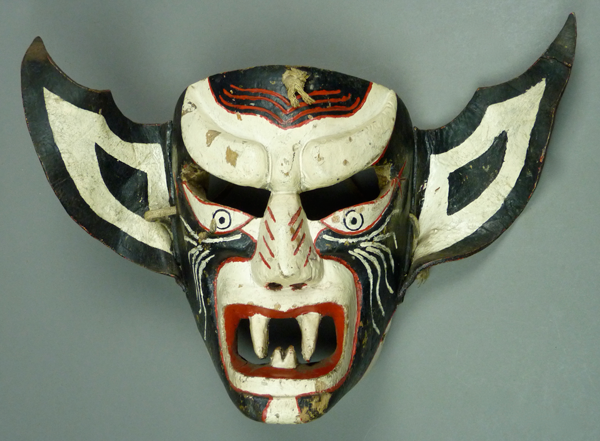 This mask is exactly the same size as the last—9½ inches tall, 7 inches wide, and 4½ inches deep. The next two masks represent vampires. This one has bat-like ears made of leather. I also got this mask from Robin and Barbara Cleaver in 1987. The effect of this malevolent expression is enhanced by the leather ears or wings; we are greeted by a vampire bat. The Vampire is 9 inches tall, 7 inches wide, and 4 inches deep, not counting the leather ears. A mask like this one also appeared in the Política article. Here is a second Vampire mask. 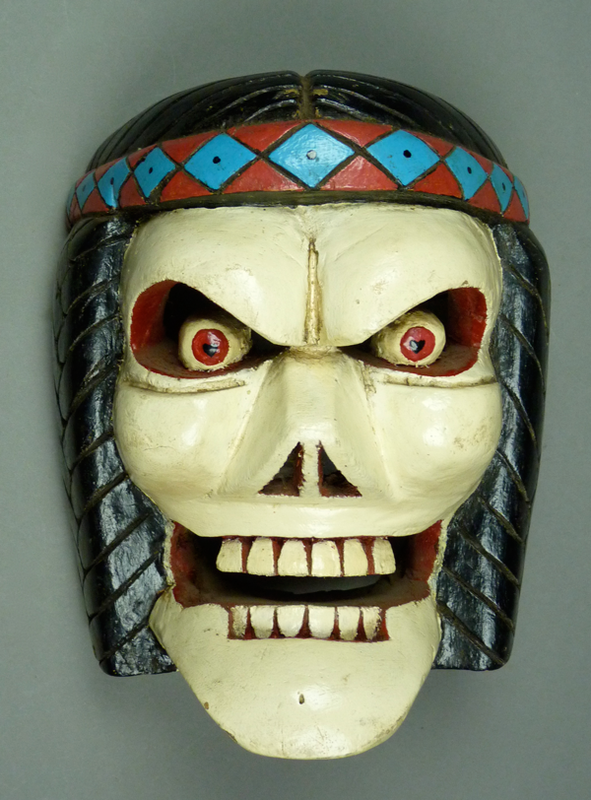 Looking at this series of masks, one begins to get a feel for the Naolinco design style, by whatever carver. This Vampire is 8 inches tall, 6½ inches wide, and 5 inches deep. Again we find an unsigned back. 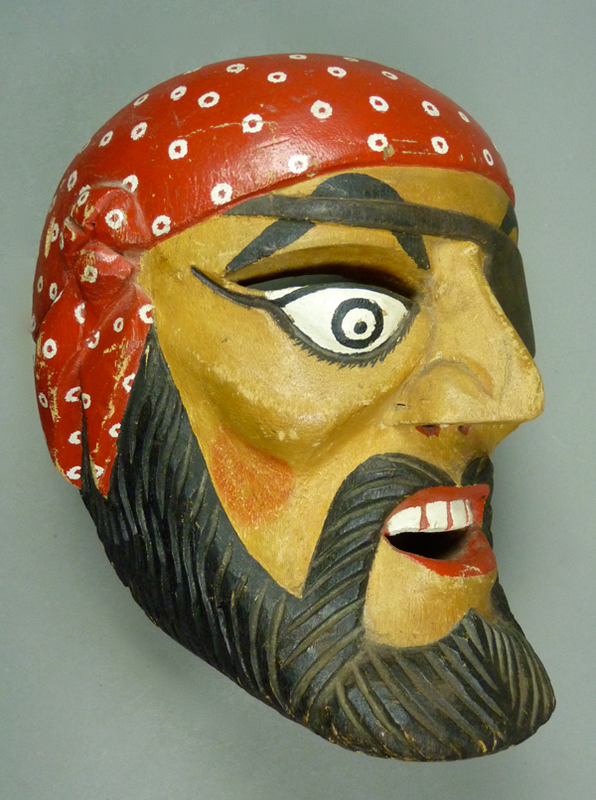 Here is a pirate Negrito mask that was found in a Cancun bar, illuminated from behind by a light bulb. The back was charred from this arrangement. I bought this mask on EBay™ in 2003. We saw a similar mask in the Política article. This is not a very menacing face, is it? Some of these masks are more playful than fearsome. 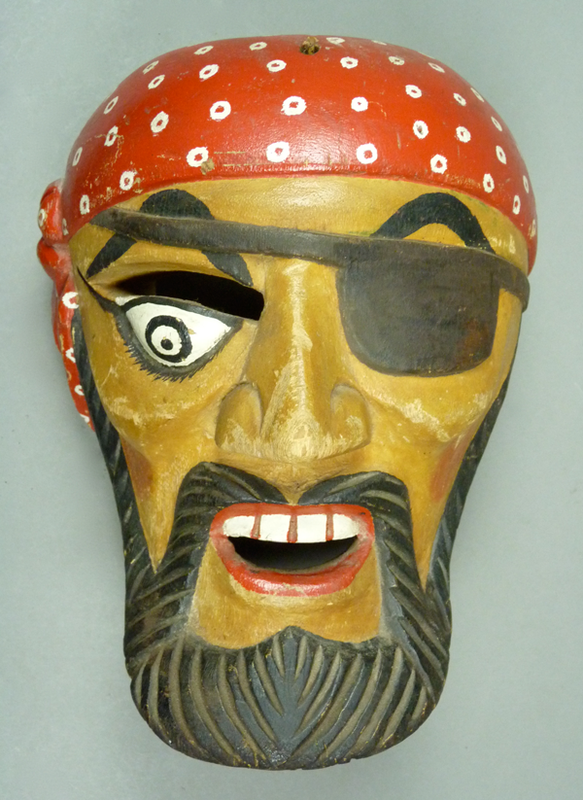 The Pirate is 10 inches tall, 7½ inches wide, and 6 inches deep. 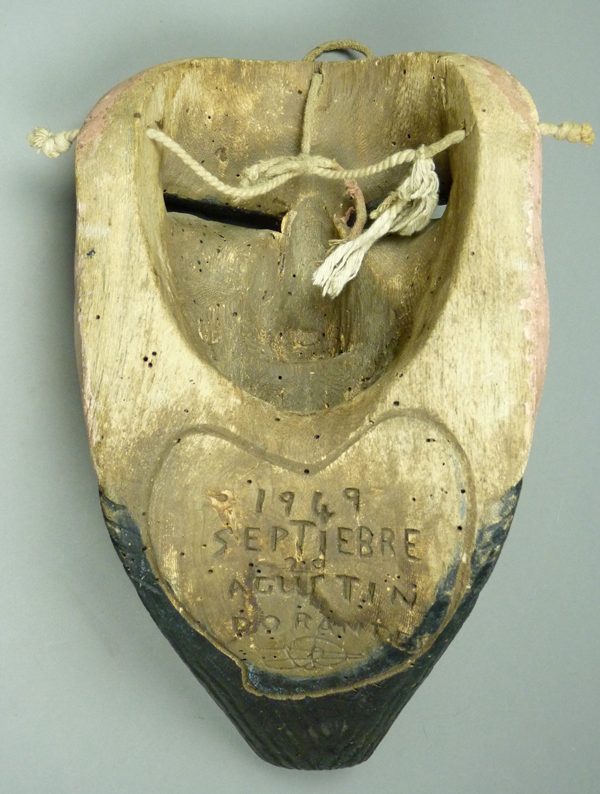 The back of the Pirate is carved with the linked LMR initials of Lino Mora. The charred areas from the light bulb cause one to wonder whether the overheated mask had ultimately burst into flame. 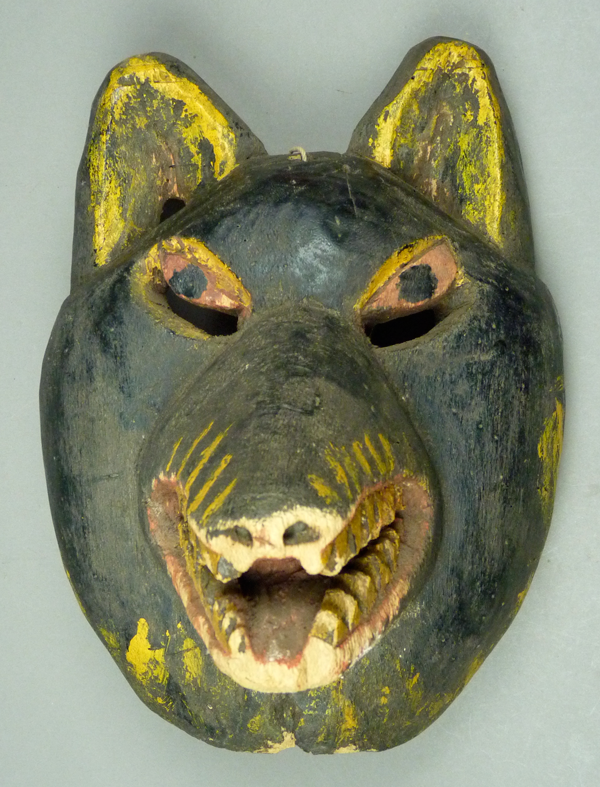 Another mask depicts a Werewolf. This too came from Robin and Barbara Cleaver in 1987. 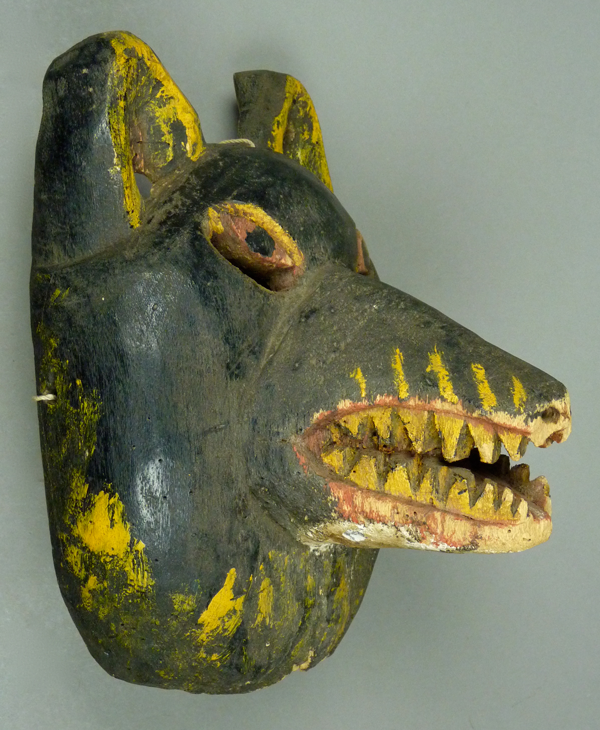 The yellow decoration and the red eyes convey the supernatural nature of this wolf. The Werewolf is 8 inches tall, 6½ inches wide, and 5 inches deep. 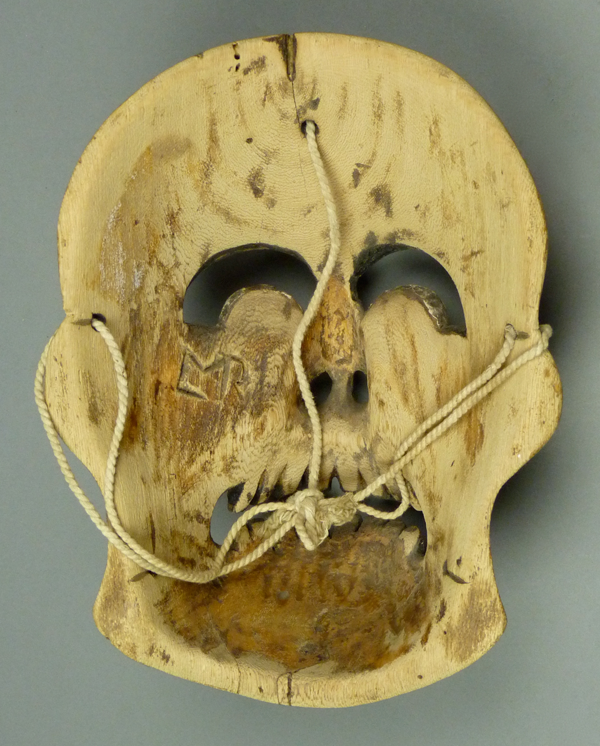 The very last mask in this post is another from the Urmston collection. 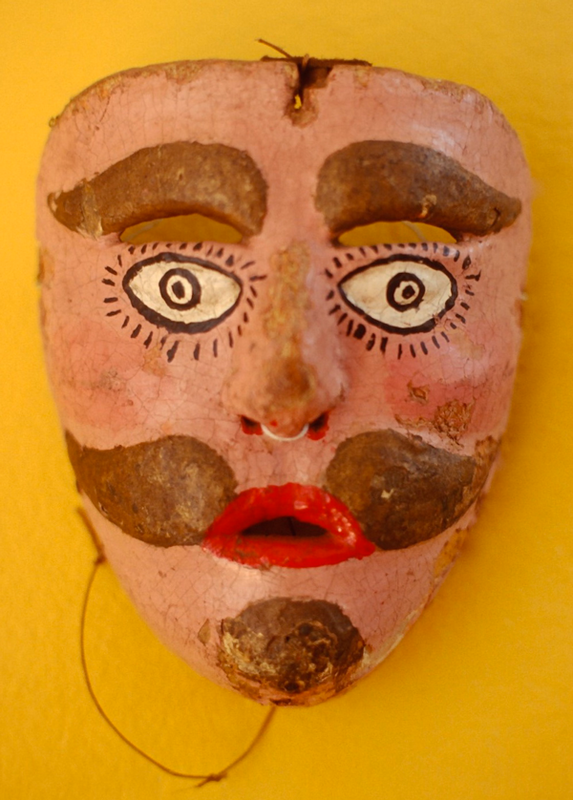 This may well be a Negrito mask from Naolinco and it is for sale as of this writing. The Urmston tag identifies it as a “Rabid Dog” from the state of Veracruz. As you have seen from today’s masks, the Negritos represent the malevolent dead/undead, and it seems a short stretch to include a dying or already dead mad dog to this category. 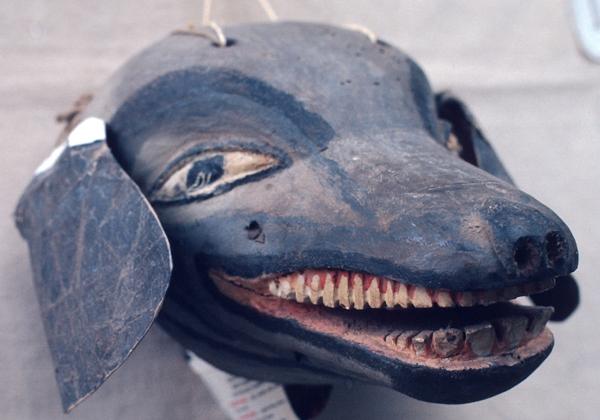 I wouldn’t have nominated just any dog mask to the Negritos group, but it is highly unusual to encounter a dog mask that is so explicitly identified as dangerous or malignant. For the Curious—Although this Naolinco dance is usually referred to as a local version of La Danza de los Moros y Cristianos (the dance of the Moors and Christians), it is far better understood as an example of the Santiagos (or Santiagueros) dance. Briefly, it is clear enough that the Moros y Cristianos dance is about the battle between those two adversaries, while the Sierra de Puebla version of the Santiagos dance is about conflict between two misnamed adversaries, two adversaries with disguised identities. There is reason to suspect that the same is true for the Naolinco version. On the surface, the adversaries in the Sierra de Puebla version of the Santiagos dance are Santiago and the Santiagueros (“Christians”) versus Pilato and the Pilatos (“Moors”). 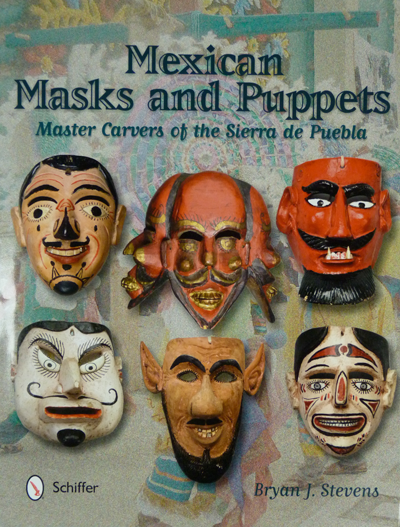 However, as I explained in Mexican Masks and Puppets (2012, pages 58-63 ), in that region these names conceal a secret. The Santiagueros represent the Indians, who view themselves as the “true Christians;” they serve Christ/ Sun. The Pilatos represent the Spanish overlords who had exploited and mistreated the Indians while claiming to be Christians. They are led by Pilato, however he is actually Satan. All this is hidden under subterfuge. For example Sabario, the leader of the Santiagueros, behaves as if he is the ally of Pilato and calls himself the enemy of Christendom (when he is actually the enemy of the false Christians). The Santiagueros behave as if they have little connection with Santiago, leaving him to fight his battles alone, apparently to disguise their close alliance. Such obfuscation is only slightly different in Naolinco. Sabario is the leader of the Caines dancers, a name that was probably chosen to obscure their identity or loyalty. They mill around on the edges of the conflict, so that Santiago and two assistants must fight alone against the Negritos, a frightening horde of the living dead, the undead. Pilato is present, but published explanations fail to link him to the Negritos. Instead, he is said to be there in the midst of the conflict as a peacemaker between the two sides, which seems patently unlikely! So I strongly suspect that the Negritos represent the Spanish, Pilato is still Satan (the leader of the undead), and the Caines are really the Indians. Such speculation was directly supported by the available literature in the Sierra de Puebla, but I am as yet unaware of a parallel literature for the region that contains Naolinco, the Huasteca. I hope that you have enjoyed this introduction to the vivid Moros y Cristianos dance of Naolinco. 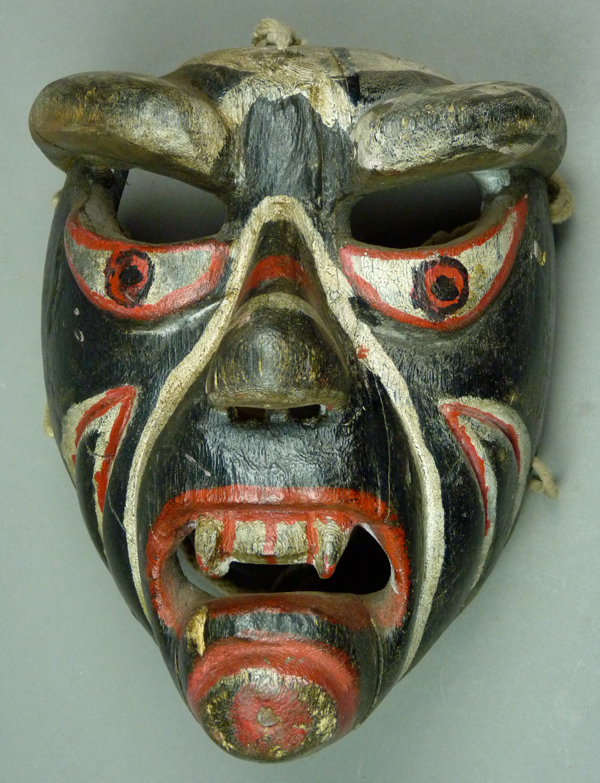 Next week I will continue to present masks from the Urmston collection along with information about the related dances. I can relate to your post, thank you for relating it to readers about the dance, and it’s history. I learnt somethings not known before, for I spent much time in Naolinco with Lino Mora in 1995 studying this amazing ‘Danza de los Moros y Cristianos’ with him. Many a day I would watch him work, whilst he talked, fuelling me with fascinating info for my dissertation. I had promised him a copy of it, and only now am I getting around to doing so. I am seeking his address, but perhaps I may not need it, he being so well known…. I am glad that you found my post interesting. Obviously I am a great admirer of Lino. Lino Mora Rivera is on Facebook, so you can open communication directly with him on that site. When you were hanging out with Lino, did you take photos? I would like to see what you wrote.